Friends of Real Lancashire (FORL) is a pressure group affiliated to the Association of British Counties calling for the wider recognition of the historic boundaries of Lancashire in England. Its chairman is Chris Dawson. The historic borders of Lancashire. Non-metropolitan Lancashire shown in red, with the two unitary authorities in ceremonial Lancashire orange. The Friends of Real Lancashire are concerned to promote what they view as, the true boundaries of the county, namely those of the County Palatine of Lancaster. The current local government boundary of Lancashire was established in 1974 by the Local Government Act 1972. 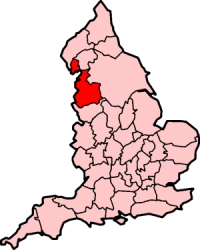 Lancashire saw more upheaval from this Act than most counties, having most of its population transferred to the new counties: Manchester and the rest of south east Lancashire became part of Greater Manchester; Liverpool and the rest of south west Lancashire became part of Merseyside; Furness became part of Cumbria; and Warrington and Widnes became part of Cheshire. The boundary changes were not intended to affect loyalties but they caused concern in some areas and in practice it is the new boundaries which are now shown on maps and marked by road signs. They have also been widely adopted by the media as geographical designations, despite that many within the new counties continue to regard themselves as Lancastrians. The historic county boundaries continue to be used as the basis for organisations such as the Duchy of Lancaster, Lancashire County Cricket Club and Lancashire County Football Association (although its area overlaps with the Liverpool and Manchester Football Associations, both of which predate their corresponding metropolitan counties). The area under the control of Lancashire County Council, or shire county, became even smaller in 1998 when Blackpool and Blackburn with Darwen became unitary authorities. Although they remain part of the ceremonial county, they are often no longer mapped as part of Lancashire and "Welcome to Lancashire" road signs have been placed on their boundaries with the shire county. The group counts at least nine MPs (Jake Berry, Gordon Birtwistle, Simon Danczuk, Nigel Evans, Lindsay Hoyle, John Leech, David Nuttall, John Pugh and Ben Wallace) amongst its supporters and has been mentioned in Hansard. It has received limited support within local government, and its campaign has also mentioned in the local press. Lancashire Life magazine identifies itself as an enthusiastic supporter of the group and continues to cover the historic county area. The restoration of the historic boundaries of the Lancashire ceremonial county with the Lord-Lieutenant of Lancashire covering everywhere within the historic borders. Road signs to mark the historic boundaries with Cheshire, Yorkshire, Westmorland and Cumberland. The historic boundaries to be shown on Ordnance Survey and other maps rather than the current administrative boundaries. Destruction of the occupied counties of Greater Manchester and Merseyside and the return to one glorious, reunited Lancashire. The group also campaigns to have public bodies named in accordance with historic rather than contemporary county names e.g. NHS ambulance authority reforms. However, they do not propose any changes to administrative boundaries. FORL's campaign has met with limited success. In 1994 it raised a petition with 30,000 signatures calling "for the restoration of Lancashire's historic boundaries" – the petition requested that the "Metropolitan Counties of Merseyside, Greater Manchester and Cumbria be abolished and the real and historic county of Lancashire be restored". In response to other suggestions of restoring former boundaries, the Government has commented that although it has no plans to restore the historic borders of counties, boundary changes that have occurred need not affect loyalties. The Local Government Commission for England made draft recommendations in as part of a review of the structure of local government in Cumbria that the "areas of Barrow-in-Furness Borough Council and South Lakeland District Council formerly in Lancashire should be returned to historic Lancashire for ceremonial and related purposes". The final recommendations noted that "the Commission heard from few people on this subject during the consultation period, although support was indicated by the Friends of Real Lancashire", and consequently proposed no change. The group succeeded in having signs erected near Clitheroe, Nelson and Colne marking the traditional border with the West Riding of Yorkshire, on roads which are currently managed by Lancashire County Council, and paid for at no expense to that body. A similar request to Cumbria County Council, to mark the historic borders between Westmorland and Cumberland and Lancashire was denied in 1996. In 2001, the leader of the council was presented with a framed map, created by the group, depicting the historic boundaries. It was put on display at County Hall. Lancaster City Council endorsed the group's position in June 2002, resolving that the Council "support the Friends of Real Lancashire’s campaign to restore the former geographical county boundaries". The Royal Mail no longer require the use of their former postal counties when addressing letters and instead use the postcode and post town to direct mail. As part of their flexible addressing policy, anyone may now include "Lancashire" as part of their address. Where a county is provided however, it will be ignored and to this end, an alias file supplement to the Postcode Address File cross references county and other postally-not-required information to the correct postal address. In 2013, Secretary of State for Communities and Local Government Eric Pickles formally recognised and acknowledged the continued existence of England's 39 historic counties, including the traditional boundaries of Lancashire. As part of its campaign the group has adopted 27 November as Lancashire Day, this being the day in 1295 when Lancashire sent its first representatives to Parliament. It was first celebrated in 1996 with the Loyal Toast to "The Queen, Duke of Lancaster". Lancashire Day paralleled the similar Yorkshire Day, first held in 1975. At formal events and Lancastrian military events "Long live our noble Duke", an unofficial Lancashire variant of "God save the Queen" is played in respect for the Duke of Lancaster, the Queen. Lancashire Day has been widely publicised, including mentions on the BBC website. It has received support from both district councils and the county council. ^ a b https://publications.parliament.uk/pa/cm199596/cmhansrd/vo951204/debtext/51204-30.htm |chapter-url= missing title (help). Parliamentary Debates (Hansard). House of Commons. 4 December 1995. col. 116. ^ https://publications.parliament.uk/pa/cm199394/cmhansrd/1994-04-21/Debate-13.html |chapter-url= missing title (help). Parliamentary Debates (Hansard). House of Commons. 21 April 1994. col. 1146. ^ https://publications.parliament.uk/pa/cm199596/cmhansrd/vo960131/text/60131w20.htm |chapter-url= missing title (help). Parliamentary Debates (Hansard). House of Commons. 31 January 1996. col. 821. ^ Local Government Commission for England. The Future Local Government of Cumbria: Draft Recommendations. June 1994. ^ Local Government Commission for England. Final Recommendations on the Future Local Government of Cumbria. October 1994. ^ Ancient boundary signs to be revived Telegraph & Argus. January 8, 2000. ^ "Eric Pickles: celebrate St George and England's traditional counties". Department for Communities and Local Government. 23 April 2013. Retrieved 22 June 2013. ^ Kelner, Simon (23 April 2013). "Eric Pickles's championing of traditional English counties is something we can all get behind". London: The Independent. Retrieved 22 June 2013. ^ Garber, Michael (23 April 2013). "Government 'formally acknowledges' the Historic Counties to Celebrate St George's Day". Association of British Counties. Retrieved 22 June 2013. This page was last edited on 17 February 2019, at 22:22 (UTC).